(Photo above) Master Gardeners celebrate Sue! l-r: Kunda Sashital, Mimi Enright (program coordinator), Electra de Peyster, Phyllis Turrill (Board President), Janet Thorp, SUE LOVELACE, Steve Ehrmann, Bryce Sumner, Susan Shaw, Stephanie Wrightson and Tweedy Olson. A number of Master Gardeners turned out on Thursday April 13, 2017 to see one of our own honored by the Sonoma County Board of Supervisors at the annual Volunteer Recognition event hosted by the County of Sonoma. This year our membership chose to honor Sue Lovelace as our outstanding volunteer of the year. Sue completed the training to become a Master Gardener in 2007, and she has been a very active member of the organization from the start. Sue received her platinum badge in 2016 signifying that she has volunteered over 2500 hours with the organization in educational outreach to the residents of Sonoma County. As of March 2017, she has now volunteered nearly 3000 hours! Sue is both a Food Gardening and Garden Sense Specialist as well as a sought after speaker in our library lecture series. Sue has also helped in training new Master Gardeners. As a Food Gardening Specialist she has actively worked with school gardens via our Youth Gardening Program as well as with community and senior housing center gardens. Since 2013 Sue has written the very popular weekly “Sundays with Sue” blog on the Sonoma County Master Gardener Facebook page where she shares information on growing food in your backyard. She has played an active role in edible food garden designs for several Bloomin’ Backyards garden tours and the pollinator garden design for the Master Gardener demo garden at Bayer Farm. Sue was also one of 2 MG’s who served as our “talent” on our “Growing Vegetables with Less Water” video. Sue has been a Garden Sense specialist since the program’s inception in 2013; to date she has completed over 50 home visits to consult with local residents on reducing their home landscape water usage! 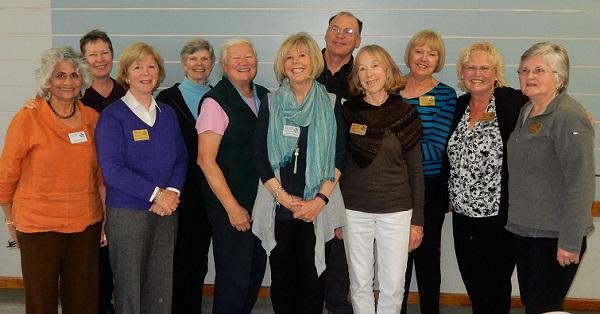 Sue’s charming personality shines through in all of her work with the UC Master Gardener Program of Sonoma County. Truly we are lucky to have her serving our community as a UC Master Gardener of Sonoma County. Now, Therefore, Be It Resolved, on behalf of the citizens of the County of Sonoma, this Board of Supervisors hereby expresses its sincere and heartfelt appreciation to Sue Lovelace for her valuable contributions. Sue (second from left) receiving her recognition from Sonoma County Supervisors Susan Gorin, Shirlee Zane, Sylvia Lemus, and David Rabbitt.